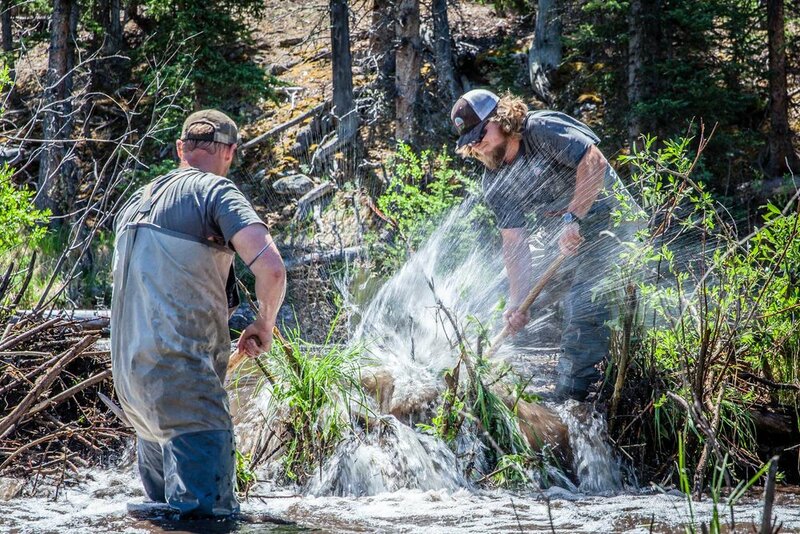 Volunteers working to dislodge a disruptive beaver dam along Rock Creek drainage in Colorado. Image courtesy of: Basin+Bend. 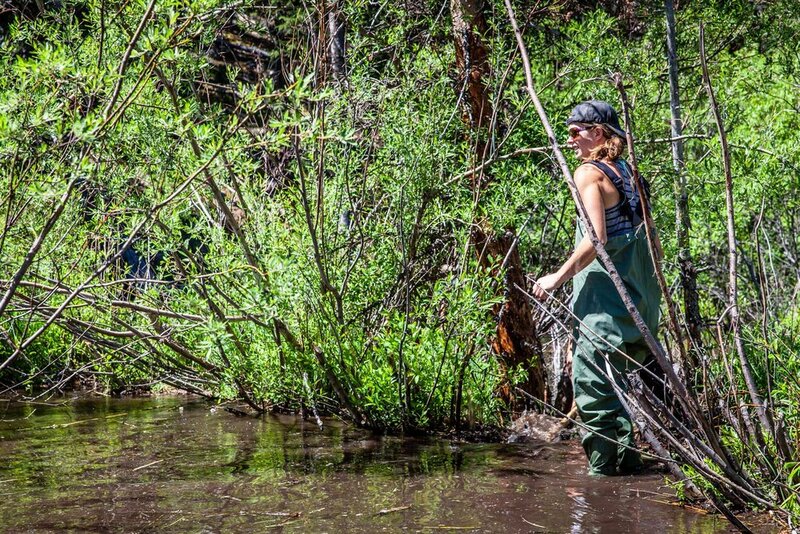 On June 21, 2018, volunteers and Colorado Parks and Wildlife staff met between Fairplay and Grant, CO to work on helping take down beaver dams along the Rock Creek drainage. The Rock Creek drainage is a critical piece of the Greenback recovery puzzle and will provide nearly eight miles of connected stream habitat once the project is completed. With the help of Trout Unlimited volunteers and chapters, agency partners, and private landowners, there are 4.5 miles of stream that are currently being prepared for greenback reintroduction in the next 2-3 years. The project below will help make progress on the remaining 3.4 miles of critical habitat. 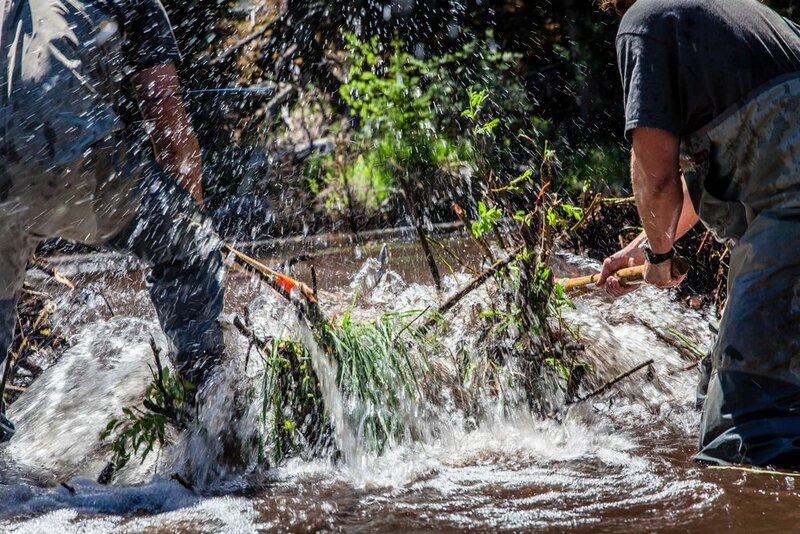 Last Thursday, volunteers focused on removing beaver dams from sections of the Rock Creek drainage in order to help CPW treat the area for Whirling Disease and non-native brook trout. Volunteers hiked up about a mile and used various tools to help dislodge the dams that were blocking creek flows. A huge thank you to all the volunteers for all their hard work, which resulted in the second scheduled day of work not being needed! Nice job, everyone! If you are interested in future projects, we have upcoming ones listed here. 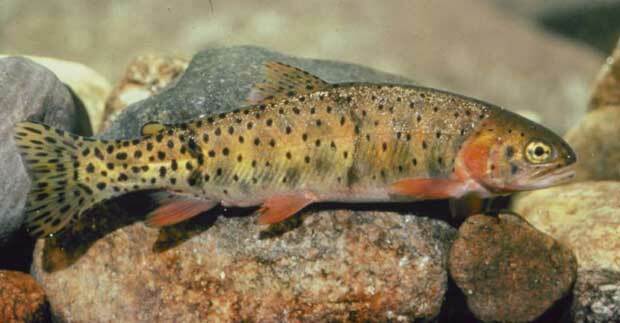 To learn more about Native trout and restoration projects across Colorado check out our page here. Check out the great pictures taken by Erik Myhre of Basin+Bend in Evergreen, CO.
Fun Fact Friday: Oh, the mighty Colorado River! Its history is quite impressive as it broke through the Grand Canyon about 5 million years ago. Evidence also suggests that the Colorado River was flowing through the Rocky Mountains as they were still forming. This river has influenced much of the beautiful geology we see across the west today. All along the Colorado River system, anglers can find largemouth bass, rainbow trout, channel catfish, black crappie, walleye and striped bass. 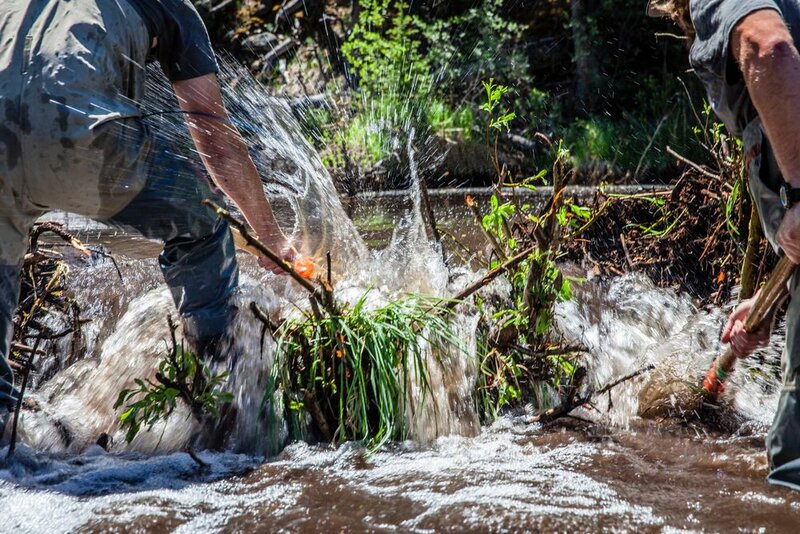 If you have not checked out the interview we did with Kirk Klancke, president of the Colorado River Headwaters TU Chapter, about restoring flows to one of the first main tributaries of the Colorado River, then be sure to check it out here. We have been dealing with invasive species since humans starting transporting goods across land and sea. Many species that we think of as natives might just be an original hitchhiker from a long time ago. Sometimes these things happen by accident when something snags a ride with an unsuspecting host or species are brought in on purpose. Why are invasives such a problem? Well, when a species is introduced to a new area, it usually has all the advantages in the world. They are likely to not have any predators and that provides them the opportunity to eat, populate quickly, and encroach on other's habitats. By the time all the original habitants catch up on who the new species is, the new guys have already established themselves and have depleted much of the area's resources. In Colorado, we have been lucky to not be plagued with the aquatic invasives that the Great Lakes area has seen, but with increased tourism and boating the state is becoming more worried about an unstoppable outbreak of the invasive species. Testing is done regularly on Colorado's bodies of water and there have been positive results for mussels. New legislation has been making its way through the State Senate and House entitled the Mussel Free Colorado Act HB18-1008, with hopes to combat the fast-spreading is invasive mussels. Both adult zebra mussels and the larval form, known as veligers, can be transported into other bodies of water. Adult zebra mussels can attach to boats or other equipment and be transported to new waters. Adult zebra mussels are able to close their shell and may survive out of water for several days. Veligers (larval zebra mussels) are able to hitchhike in water held in the bilge, live wells, motors, or bait buckets, or they may cling to plant fragments, boats or trailers, or other equipment or recreational items that came into contact with water. CLEAN: your boat, trailer and gear by removing all plants, animals and foreign objects. DRAIN: all water from the boat, including the motor, bilge, live wells and bait buckets, before leaving the lake. DRY: boat, trailer and gear at least 5 days before entering another water body. If unable to let it dry for at least 5 days, rinse equipment and watercraft (with high pressure, hot water when possible) and wipe with a towel before reuse. A few days ago, I found myself standing in my yard yelling “Yeah, c’mon! ?” while shaking my fist at a rather feeble-looking storm cloud. Now, I normally reserve this type of a pointless weekend lunacy for Broncos games and the like, but considering the dire state of the snowpack in the Colorado River Basin, including my home watershed of the Uncompahgre basin—the reaction seemed appropriate. Beyond the obvious lack of snow in my front yard, I'm seeing a seemingly endless chain of news stories highlighting lack of snow, record low river flows and, perhaps worst of all, dire projections that long-term weather trends won’t provide respite—all serving to fuel my anxiety about the summer to come. Droughts of years past have taken a serious toll on important fisheries and inflicted economic pain and hardship on water users of all stripes who depend on diverting water for their livelihoods and quality of life. These periods of shortage have also taught us valuable lessons about reacting to and preparing for drought in the West. One of those lessons is about the importance of working together on our water challenges. Throughout the basin, Trout Unlimited and water users are partnering on innovative strategies to address water supply shortfalls while protecting rivers and streams. For instance, TU is helping irrigation districts and the water users they serve in the Gunnison Basin improve irrigation infrastructure on and off the farm to reduce system losses, thereby improving stream flows on important tributaries like the Cimarron River. TU has also been at the forefront of water planning efforts in Colorado that identify needs of both the environment and water users and establish watershed-specific approaches to reducing the impacts of drought. In another innovative approach, TU is working closely with agricultural producers in the Upper Colorado River Basin through a pilot project that reimburses water users who voluntarily reduce consumptive water use through fallowing, partial fallowing or switching from high to low water-use crops. The program, known as the System Conservation Pilot Program, or SCPP, aims to improve flows on Upper Basin tributaries in a manner that not only helps reduce supply gaps at Lake Powell but also improves important fisheries. With all the water uncertainty, there’s one thing we can be certain of—this drought period won’t be the last. In fact, scientists say it’s likely that the Colorado River Basin will be facing a drier and more variable climate—all the more reason why scaling up collaborative conservation and efficiency efforts now, regardless of the snowpack levels, is critical to preparing for future drought and protecting our valuable watersheds and all that they support. Working together, we are finding solutions that can help buffer the impacts of drought years and keep our rivers and fisheries healthy. And that’s surely more effective than yelling at clouds. Cary Denison is TU’s project coordinator in the Gunnison Basin. Blog Post via Trout Unlimited. 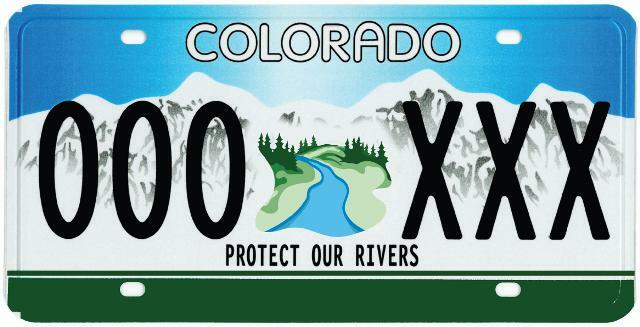 Colorado voters consider themselves to be conservationists - Not a surprise to us. A new bipartisan study, the Conservation in the West Poll, was released January 25, 2018 by the State of the Rockies Project, in conjunction with Lori Weigel, Public Opinion Strategies and Dave Metz, Fairbank, Maslin, Maullin, and Metz & Associates. The survey, conducted in eight western states, explores bi-partisan opinions in each state and for the Rocky Mountain West region concerning conservation, environment, energy, the role of government, trade-offs with economies, and citizen priorities. The survey now includes polling in the states of Arizona, Colorado, Idaho, Montana, Nevada, New Mexico, Utah and Wyoming. Colorado College in Colorado Springs has released all of the polls publications broken up by state, topic, and additional reports about Sportsmen and Agriculture. You can go through them all here, but we are going to take you through some of the most interesting results. One demographic that we are very familiar with is those who identify as a sportsman or woman. The poll found that 79% are the most likely vote sub-group to identify as a conservationist which is a 4% increase from last year. Among that voter group, 58% preferred that the Trump Administration would focus on protecting clean water, air quality, and wildlife habitats on public lands. In relation to the recent national monuments and public lands reductions happening to Utah's Grand Staircase and Bear's Ears, a majority of those who identify as a hunter or angler found this to be a largely bad idea and that any future reductions or stripping of other Monuments was also a bad idea. Currently, there is legislation around our national monuments and you can speak up against it with our current action alert. Another demographic that is extremely involved in the water issues of Colorado are voters who identify as being part of a rural or small town. Now some might think they don't share the same values as those in the growing cities of the Front Range, but that notion couldn't be farther from the truth. Rural communities overwhelmingly share similar values in regards to conservation, development, and public lands. And to sum up the state's opinions as a whole, below is an infographic showing the support for different initiatives regarding water conservation, national monuments, and outdoor recreation. If you would like a closer look at the reports shown here or any of the images in this post, see the links at the bottom of the page. The results of this poll are encouraging and also not unexpected. 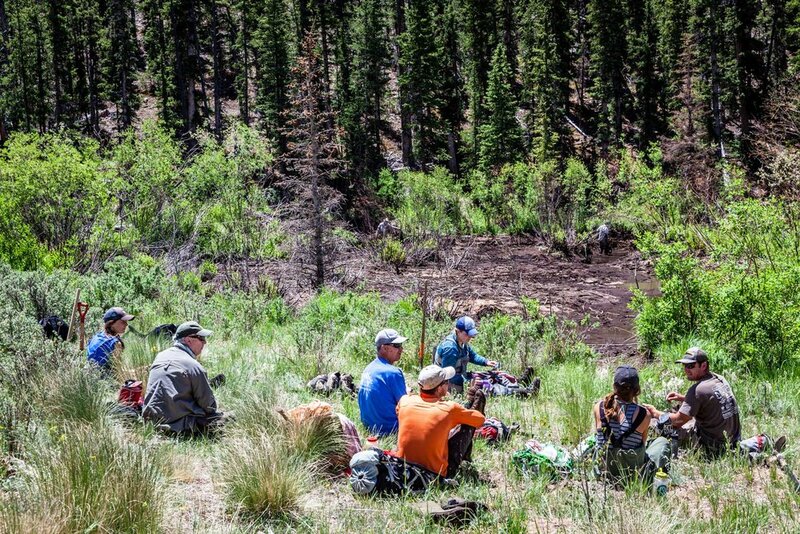 As part of Trout Unlimited, we know that our members who identify as sportsmen/women, farmers, activists, and outdoor recreationists are and have always been conservationists. This poll just further proves that we are a strong majority of people who believe in the future of clean water, access to public lands, and healthy fisheries. We stand together as a collaborative and influential community that puts conservation first.